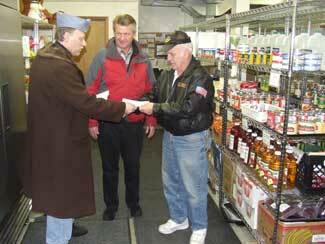 Food Shelf Donations: The American Legion Post 29 is continuing to collect food for the North St. Paul Food Shelf. Please consider donating canned or nonperishable food items. Items can be brought to the Legion anytime and placed in the appropriate containers in the bar. Thank you! 350 teams, 6,000 players in American Legion Baseball. American Legion has power of attorney for 14,000 veterans with service-connected disability claims. 400 high school juniors at Minnesota Boys State government program. 1,200 grade schoolers at Legionville School Safety Patrol Training Camp. 7,000 veterans provided information on services and benefits. $32,000 in grants to disabled Minnesota veterans. Over 400 posts provided funeral honors to veterans. Over 60,000 hours of volunteer time by Legionnaires at regional VA Medical Centers. $70,000 to Legion, Auxiliary and SAL members in need from the American Legion Family Hospital Association. Over $38,000 in National Emergency Funds distributed to families in Minnesota. Over 1,500 scholarships to high school students in Minnesota. I'd like to thank the Lillie News for helping the Sons of the American Legion advertise their fund raising events in the "Bulletin Board" section of your newspaper this past year. With your advertising help, and some hard work from our members, we were able to raise funds for several 2011 donations. The first of several of several donations in 2011 was to the North Saint Paul Food Shelf. On Tuesday, January 11, the No. 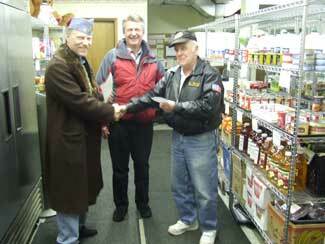 St. Paul Post #39 Sons of the American Legion (SAL) presented a check for $500 to the North Saint Paul Food Shelf. SAL Squadron leader Dennis Gordien and members Greg Niemi and (Paul Flaherty not pictured) presented the check to Dave Zick at the No. St. Paul food shelf location at 2538 Seppala Blvd. Dave Zick then provided an impressive tour of the facility to show the Legion members what it takes to make this great community service work. Dave Zick told the SAL members that the $500 donation will buy ten times that amount through his food resource suppliers. The $500 donation will bring $5000 work of food to the people that use the food shelf. The Sons of the American Legion organize occasional dinners and Sunday breakfasts as fund raisers during the year. The funds from these events go towards veteran, youth and community needs. The SAL members felt that the funds raised this past year came from the local community, and they wanted to give it back to the community. If you could publish this as an article in your paper, it would mean a lot to us and our efforts. Attached are two pictures from the SAL donation event at the No. St. Paul Food Shelf.